My mother left today to return to the States, and my month-long vacation appears to be officially over. I was able to spend three weeks at home this Christmas, and while it was great to be home and to see all my friends and family, I am excited to be back. When you´re gone for so long, it is hard to realize how much things may have changed in your absence, and being back in North Carolina resulted in a bit of culture shock. I am glad I went though, as it will make me more prepared for my eventual re-entry sometime at the end of this year. I was also lucky enough to have my parents and my aunt return with me to Guatemala. I got to spend my first week back staying in nice hotels and tourist spots, which made readjusting here much easier on me. 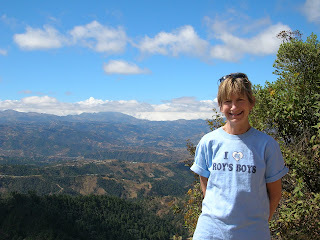 They were able to climb a volcano, visit Lake Atitlan, and come out to my site to see where I live and what I do. Although I don´t think my house was the most comfortable place for them to stay, they got used to “roughing it” Peace Corps style (I maintain that it isn’t all that different from living in the States). My mother being the brave woman that she is, stayed an extra week with me in my site and got a much better idea of my life here. I also took her on a couple hikes, so she could see the beauty outside of the center of Cabrican… which, I am sure she will agree, is stunning.